It was the Warhorse horses that took the theatrical interaction with life size puppets to a new level. Suddenly a puppet (a word sadly lacking to convey the realistic and emotional effect of the creatures) could recreate a live animal onstage and suspend disbelief. 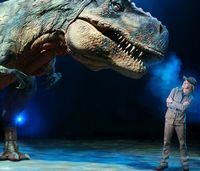 The company behind the Warhorse wizardry came from South Africa and now, inspired by the BBC Television Series Walking with Dinosaurs, Australians from the Creature Technology Company in Melbourne have created the spectacular show with these fascinating creatures from millions of years ago. My children, as was I, were enthralled by Jurassic Park and seeing the dinosaurs for the first time in Universal Studios in California, our eyes were as wide as Laura Dern's were in the movie when she first saw these majestic animals. The dinosaurs need an arena to perform in because of their tremendous size and I saw them at London's 20,000 seat stadium the O2. Michaela Strachan, a BBC naturalist and presenter, as the palaeontologist Huxley, narrates the history of the creatures as they appear in the arena. The choice of the name Huxley will appeal to those believing in evolution as Thomas Henry Huxley was the supporter, or bulldog, of Charles Darwin and who loosely said, "I'd rather be descended from a monkey than a bishop!" Instead of bishop, Huxley said, "a man who used his great gifts to obscure the truth". We start with some Plateosaurus dinosaur eggs hatching from the Triassic period, 245 to 208 million years ago, where the earth's meadows and prairies would have been covered with "ferns, low cycads, club mosses and horsetails". These dinosaurs are herbivores but a predatory carnivore, the 16 and a half feet long Liliensternus, running on two strong hind legs, balanced by a long tail would threaten the Plateosaurus hatchlings. Some recent discoveries about the appearance of the Liliensternus indicate they might have had feathers on their neck. We soon learn that the grass eaters, the vegetarians are "the good guys" and the carnivores the terrifying ones. The Plateosaurus, which means broad reptile or flat reptile is 26 to 29 feet long, could move on all fours but also rear up to feed on higher branches. This was the largest land animal of the period. We hear about the change in weather, the rainfall to Pangaea, the super continent that contained all the present known landmass, and the explosion of vegetation heralding the Jurassic period 208 to 144 million years ago. From the Jurassic period we have the footprints of dinosaurs solidified in the rock. The show introduces herbivores, the recognisable Stegosaurus, or roof lizard, with its double row of plates rising along its arched back and with a very dangerous tail. On stage the Stegosaurus is huge and clumsy – apparently its 2.8 ounce brain was adequate for its needs! The Brachiosaurus with its long and erect neck grew 22 feet long and would have had to feed continuously to maintain its large bulk of 80 tonnes. On stage we see the brachiosaurus tear leaves off the tall trees and and swallow them in a feat of digestion and puppetry. The Cretaceous Period 144 to 65 million years ago sees Pangaea break up into continents and oceans. The show features the herbivores, Ornithocheirus or Pterosaur, a flying dinosaur with a dodo like bill, the Torosaurus with its twin horns and large bony frill at the back of its skull, a bit like the Triceratops, and the Ankylosaurus with its huge club tail, a defence against the most fearsome of carnivores, the Tyrannosaurus Rex. This period sees plants developing nectar and butterflies but also the small but vicious and predatory Utahraptor with its intelligent sourcing out of a victim. The show climaxes with the enormous Tyrannosaurus Rex in gentle mothering mode towards a baby Tyrannosaurus Rex. I didn't hear any children crying and the narration language was clear and easy for a six year old to understand but there was plenty of viewing to entertain younger children. Our very generous press seats were in the very front row but those higher up would have concealed some of the mechanisms from human legs to vehicles that drove the dinosaurs. The creatures breathe smoke out of their nostrils and can lean towards the audience moving in the most realistic way. So many shows for children can seem to be just profit motivated but Walking with Dinosaurs is educational (I've learnt a lot reviewing it), value for money and impressive.